Australia Post has had some bad press recently when it was revealed that it was paying its CEO a 5.6 million dollar salary ….. about the cost of 100 Aust Post postal workers ……. it was also revealed that under this CEO’s watch, Postal staff had been reduced and services downgraded. Last time I looked, Australia Post was a Government owned entity. That means it belongs to the good old Aussie taxpayer. If it makes a loss, you, the taxpayer will pay. If it makes a profit … oh joy, it will go back to the taxpayer via general revenue. Of course, that’d be the profit AFTER paying out that obscene salary to its CEO. And when asked to comment on this disgraceful embezzlement from the public purse, all we got from our fearless leader was that the salary seemed a bit high! No immediate plan to look into how such a shocking public theft could have been allowed to occur. No suggestion of a need to ensure that it could never happen again. And my mind wanders back to another major Public funded entity (at the time) who also called in an exotic super-CEO to fix all its woes. He too cut and ran, having gouged the public for what he could get. I suppose if history is to repeat itself, the next thing we’ll see is Aust Post being floated on the stock market to attract ‘Mum and Dad investors’. On the bright side, when you import a high calibre CEO, you are guaranteed that you will get value for your money. Even though Aust Post’s services have been reduced and many of its staff have been done away with, we can look forward to a better, more efficient and streamlined service, better tailored to the current needs of the Australian community. Well, you might think that …… but you’d be sooooo wrong! My partner and I are little people. She makes beautiful, hand crafted knitwear items which she sells online. I make a few odds and ends that I have also tried to sell online …. little hand crafted things that are low dollar but that make a real difference to our bottom line. To do any of this, we are totally dependent upon a reliable and cost efficient postal service. But instead, here’s what we get. If I want to send a small package of my hand made creations to you anywhere in Australia, it will cost me around $7.00. If we are talking about a $10 item, you might be loathe to cough up another $7 to cover the postage charges. Meanwhile, I am competing with all those industrious Chinese folk. Their labour is purchased for virtually zero. Their postage facilities seemingly are subsidised by their government (who actually IS helping small business in China) and if that isn’t enough to guarantee that I can’t compete, Australia Post, that tax-payer owned entity will deliver China’s mail items to your door FOR FREE. Why would you buy from me and cop that extra seven bucks in postage costs? The screen capture at the top of this post is a shot of what happened when my partner sent a small package all the way from Tasmania, way up to New South Wales. Not quite as far as China, I know. But to get that package to her buyer took two weeks, two phone calls with lengthy discussion with Aust Post’s consultants …… and an email enquiry to Aust Post by the purchaser. 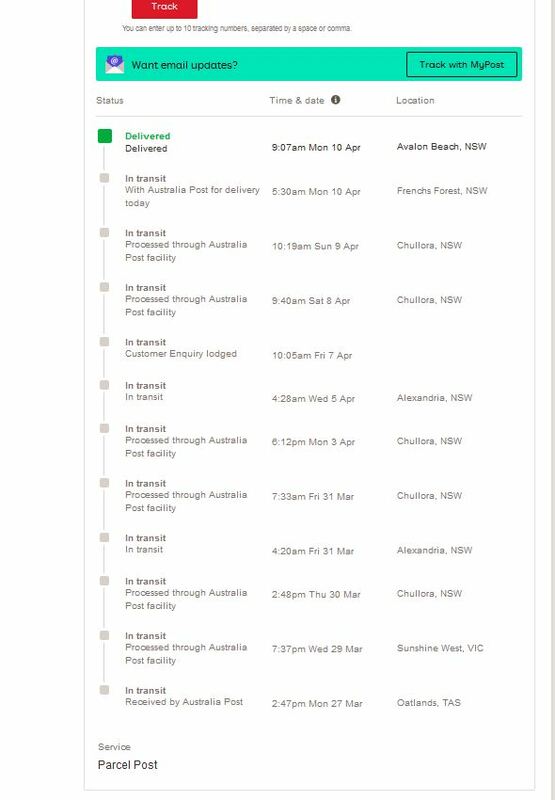 Under Aust Post’s amazingly efficient system, the parcel was bounced back and forth between Chullora and Alexandria for over a week, before they finally saved it from ‘the system’ and sent it on to French’s Forest where it was presumably supposed to go in the first place. Every night, I see that same jumped up little dweeb on the TV, endlessly spouting his free trade mantra or puffing himself up with staged photo shoots of him ‘helping out’ in the floods (probably for exactly as long as it took to actually shoot the footage). Otherwise he is having talks with this or that foreign counterpart where they are massaging each other’s egos with piles of crap about free trade and wonderful benefits for all. Small business is NOT some publicly owned company that has less than fifty employees. It’s little people like us who are simply trying to make a couple of honest dollars to stay ahead of poverty. When politicians try to marginalize segments of the community by talking about ‘leaners and lifters’ they really shouldn’t be actively preventing people from looking after themselves, by putting impediments (like the current postal arrangements) in their way. Free trade is NOT free … when the Australian taxpayer is subsidising Chinese or other foreign traders by delivering their merchandise for free while charging their Australian competition right out of the game. 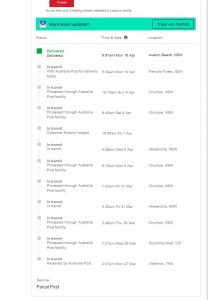 An organisation that is so inefficient as to take a full fortnight to get a parcel from Tasmania to NSW, has a CEO who is definitely not worth spit …. much less 5.6 million dollars per year. You would impress me more if you’d spend less time on your PR and more time on your job …. like ensuring that the Australian public is protected from the kind of legalised rip-off that we see when so-called CEO’s of public entities are being paid remunerations that are nothing less that a public disgrace. And finally, it is clear to me and lots of other Australians, that your so-called free trade will actually be the death of the Australian economy and our economic future. There are plenty of us ordinary folks who aren’t buying what you are peddling. As it stands, despite my total contempt for what currently passes for a President in the U.S., against you he doesn’t look too bad. In fact, compared with you, even Pauline doesn’t look quite so inept.